The W1070 is ISF Certified for customization to any room, offering calibration for optimized color performance in both Day and Night modes that can adapt to any room's layout, size and ambient light levels. 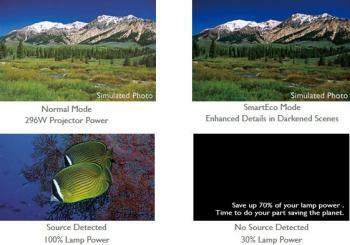 SmartEco lamp saving technology offers great energy savings and delivers amazing quality. Enjoy 1080p Full-HD image projection up to 200 inches in the comfort of your living room with the W1070 Home Entertainment Projector. You'll be captivated by brilliant image performance featuring the native 1080p DarkChip3 DLP Technology by Texas Instrument, 10,000:1 contrast ratio and a 2000 lumen brightness. Built-in speakers and easy set-up seal the deal on this user-friendly experience. Showcase Full-HD content in sharp, 1080p definition and enjoy Blu-ray, video games and HD broadcasting in beautiful, high-contrast quality without downscaling or compression. The W1070 supports multiple forms of 3D--including HDMI, Blu-Ray, 3D broadcasting, video games and NVIDIA 3DTV PC connectivity--in 1080p Full-HD for maximum enjoyment. You'll appreciate uninterrupted viewing with no crosstalk thanks to DLP technology and new glasses designed for comfort and peak image quality. Play from many devices with HDMI x 2 and multiple connectivity options. 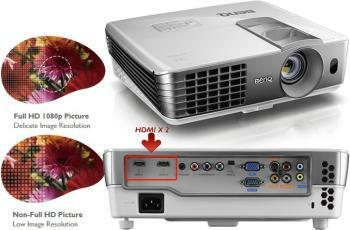 Offering lower maintenance cost and optimized projection through dynamic power saving, uncompromised brightness, exquisite picture quality and optimized lamp life--BenQ's SmartEco technology has perfected what a DLP projector can do in home entertainment. With this special innovation, you are able to save up to 70% of lamp power consumption and lower maintenance costs through dynamic power saving features while bringing ultra-vivid picture quality in every living room. The SmartEco Mode cleverly adjusts the lamp power to maximize power saving, by delivering the best contrast and brightness performance using only as much light as needed. And the Eco Blank mode dims the lamp power automatically, lowering the total power consumption by 70%. All you need to do is press the "Eco Blank Mode" button on the keypad or the "Blank" button on the remote control. For radiant, life-like color, trust BenQ to deliver. From business presentations and educational venues to spectacular events and home entertainment, Colorific from BenQ is the only way to experience your projected images. BenQ projectors' DLP technology display more than one billion stunning colors, compared to only 16.7 million from many LCD projectors in the same class. Combining up to 6 different colors to create vibrant, true to life images versus traditional 3-color LCD architecture, projectors equipped with Colorific technology can deliver up to 3x more contrast than similar top-selling LCD models. Enjoy richer blacks and more luminous whites for easy to read images, with a consistent quality image--no light burn or reduction in color quality over time. Colorific images are the same now, and years from now.